House Republicans have lined up behind an effort to reverse a shady Obamacare bailout for health insurance companies secured by top Senate Democrat Chuck Schumer in clandestine budget talks earlier this year. But with the clock ticking on the 115th Congress, the proposal has yet to see floor action, despite the fact Schumer's bailout reeks of cronyism, props up Obamacare, and threatens to bring down a key Republican health care policy win from the George Bush era. 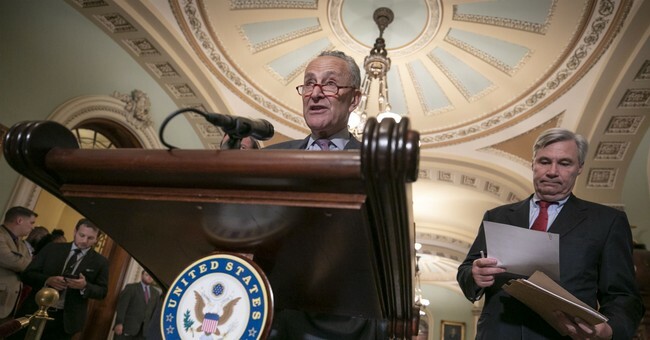 The Schumer Obamacare bailout essentially transferred $3 billion from the pharmaceutical drug sector to keep another, health insurance companies, from lurching into an Obamacare-driven death spiral. More specifically, the budget deal required the drug companies to pay most of insurers' costs in the Medicare Part D program, dangerously unmooring the program's carefully designed incentive structure from economic reality. Insurance can be a lucrative business, but that's especially true when you don't have to pay for your customers' claims! Insurers participating in Part D are now only on the hook for 5 percent of the cost of patient's drugs. This is more than merely unfair to the drug companies now paying the tab, by order of a midnight budget deal negotiated in a secret and voted on with little-to-no public debate. It's also catastrophic to the market-based design of the Part D program responsible for it coming in massively under budget. Without needing to pay these costs, insurance companies are left with little incentive to keep costs down, just like the many, many other parts of the healthcare system with heavy government intervention and spiraling costs. Part D, signed into law by then-President George W. Bush, is the only large government program in history to have ever come in significantly under budget -- 40% less than CBO estimates that liberals like Schumer used to try to kill it at the time. With the prospect of a debt crisis from entitlements on the medium-to-long-term horizon, the idea that costs might be constrained by market-based programs that utilize competition rather than rationing had stood as a major point of hope for future reforms. Now it's being pillaged by Schumer to bailout his health insurance cronies and shore up Obamacare. Republicans still have the power to stop it before Part D starts to take on water, but they should act quickly to minimize disruption to the previously established market forces that had kept costs down. Insurance companies like New York Life Insurance are among Schumer's biggest donors across his entire congressional career. Moreover, an army of former Schumer aides now preside on K Street, charging $1000 an hour to pass word on to their former boss. Several of Schumer's former aides are among the insurance lobby's heavy hitters. Even for Washington, this deal was the epitome of the "smoke-filled room," so much so that when the bill came to the floor, hours after it was unveiled to the public in the middle of the night, most members of Congress had no idea they were voting for an Obamacare bailout. Instead, like many bad ideas from Washington, it was quietly tucked deep into a bill that touched a thousand other subjects, obscuring the debate about any of them. Thankfully, conservatives in the House are leading the push to eliminate the Schumer Obamacare bailout. In June, Richard Hudson, organized a group of 155 House Republicans -- a large majority of the GOP Conference -- behind a letter calling for repeal of the Schumer Obamacare Bailout. But it's now September and the bailout is still in place. Congress should move quickly to repeal Schumer's cozy deal to prop up Obamacare, and save one of the best hopes for true health care reform in the process. With the mid-term elections looming, they had better stop Schumer and the Democrat's political nepotism before the voters go to the polls in November! Healthcare should be "for the people!"